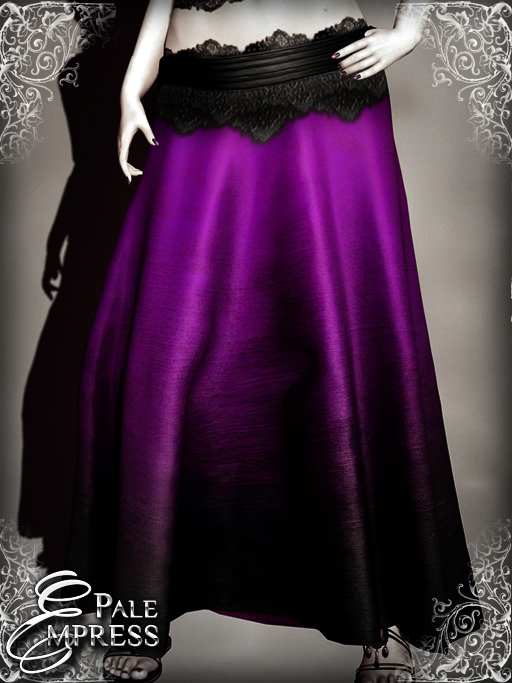 Pale Empress brought two new releases to the World Goth Fair: elegant Malina and sassy Astrid. Malina is draped in a soft knit dress with a pointed hem, a pattern of bare branches growing upwards to embrace her silhouette. Astrid flaunts her figure in a stitched leather skirt with a feminine swirl print top, taking the world in strides. Together they form a perfect spectrum of femininity, from delicate to daring, from classic to retro, from gala to club. These are rigged mesh items that move with your avatar. In addition to the five standard sizes there are also two additional ones: XS+ that provides more generous curves in the top part of base XS and M+ that has more muscles and extra curves than base M. Please try the demos. Both permissions are M/C/NT and they are available in 13 colours. L295 per colour, L1917 for the fatpack. The World Goth Fair is over for the year and both dresses are now available in the main store and the Marketplace.